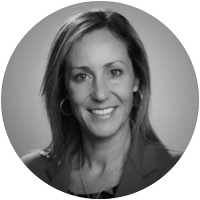 This week, I headed out west to attend SWK Technologies’ “Empower 2015” Sage 100 User Conference. 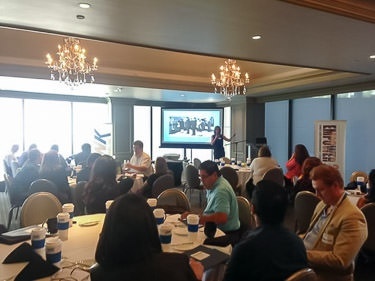 There were dozens of customers in attendance from Southern California, and also quite a few who traveled from other parts of the southwest for a day of learning and networking at The Center Club in Costa Mesa, CA. SWK had a large contingency on hand to host their customers, including CEO Jeff Roth, and I talked to three different Sage representatives who came by to show their support. And I think they hit their mark, because much like Alex himself, this event was action-packed. SWK kept the content coming, bringing up one speaker after another, each of whom gave the attendees valuable information, but didn’t get so deep into the weeds that they lost their audience. SWK’s team of experts presented sessions on new features in Sage 100 2015, reporting options for Sage 100 (always a tough one to explain, but David Birdwell helped clear up the options), and a tips & tricks/technical Q&A. 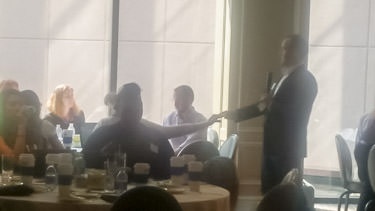 One of my favorite moments pictured above – my friend Matt Kantelis with Avalara handed out $20 bills to people who could answer his wacky tax questions. I had to chuckle wondering if those services were tax exempt in California. 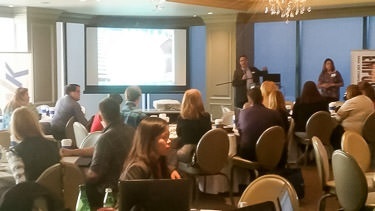 I gave a 20 minute overview how including Sage in their B2B eCommerce strategy can help the attendees increase profits. 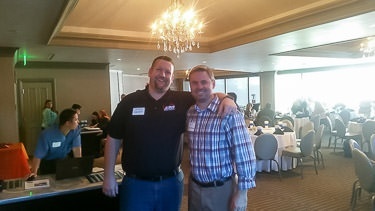 Photo credit to the lovely Gabi Morales from Altec, another sponsor of the event. Don’t worry, those people in the back who look like they’re not paying attention were actually just so riveted that they were live tweeting my session…I think. We also saw great presentations from our friends at Renovo, Altec, Concur, ONE for Sage 100, MAPADOC, and V-Technologies. We finished the day with cocktails and networking in the courtyard, catching up with old friends and colleagues and making new ones. Cody Smith with Scanco and ONE for Sage 100 with our former Website Pipeline teammate, Brian Nunes. Thanks to all the attendees for joining us, and to SWK Technologies for being a great partner and trusting us to provide excellent service to all our mutual customers!